When people ask fourth-year student Megan Hardie what she studies at Ohio State, she tells them: “I study you. I study myself. I study everyone, basically.” The St. Louis native‘s love of studying humans led her to pursue a double major in English and anthropological sciences – and it keeps her very busy. One of the many activities that keeps her busy is her job as a volunteer researcher in the lab of Clark Larsen, Distinguished University Professor in the Department of Anthropology. As part of her job duties, Hardie cleans and catalogs human remains that are more than five centuries old. Hardie recommends that anthropology students get involved in research any way they can, citing the valuable experience she’s gotten from working alongside Larsen. Hardie is also an educator with the Anthropology Public Outreach Program, a student organization that introduces youth to anthropology at places like COSI. Hardie said the organization’s mission resonates with her, particularly because she didn’t learn about anthropology as a career path until she watched "Bones" in high school. Over the summer, Hardie completed a month-long internship with the University of Tennessee, Knoxville. The university is home to the first human decomposition facility in the world (also known as a “body farm”), which provides training and research opportunities to everyone from law enforcement officers to anatomy and anthropology students like Hardie. She spent her days documenting human decomposition and collecting and cataloguing skeletal remains. 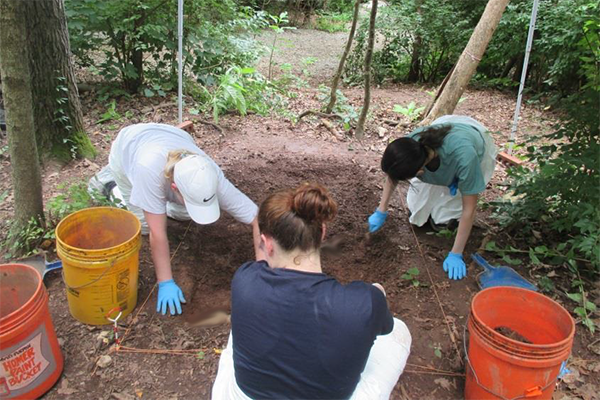 As part of her internship, Hardie had the opportunity to collect and catalog human remains. According to Hardie, the internship was an incredible learning experience, offering both exposure to the environment of a field site and to anthropologists already in the profession. Hardie is also grateful for the insight the experience gave her into two sub-fields of anthropology that have interested her throughout her college career: forensics and bioarcheology. By speaking with professionals in the field, she was relieved to learn she could pursue both in her career. Within forensics, Hardie is interested in improving identification methods used on human remains, specifically in areas where mass fatalities have occurred as a result of human rights violations. Hardie is also passionate about the repatriation of remains to Native American communities. Often when human remains are found in the United States, they are collected and then put into storage. Hardie wants to become a consultant to identify the remains of Native Americans and then act as an intermediary between the tribes and the anthropology community, to ensure the remains are repatriated to the closest affiliated tribe. She also hopes to educate future anthropologists on this issue. “We’re trying to raise awareness in anthropology classes that this has happened in the past, and we need to stop history from perpetuating itself,” Hardie explained. Hardie says the biggest thing she’s gained from her anthropology courses is a holistic view of humanity. For aspiring anthropologists, Hardie recommends sampling courses from different disciplines within anthropology. She explains that even though the subject matter can vary dramatically — like between cultural anthropology and bioarcheology, for example — it’s important to approach the field with a broad perspective. Although Hardie’s chosen field is highly technical, she still looks for the human element in everything she does.